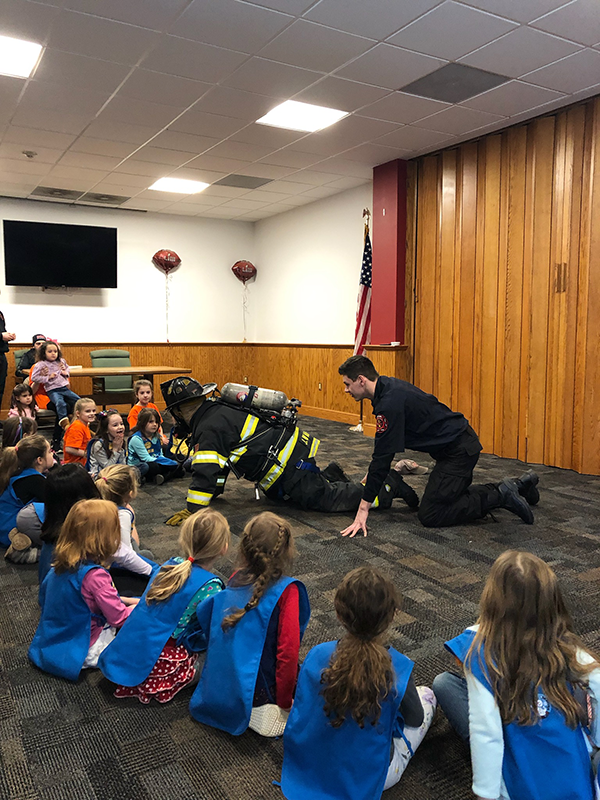 (above) Girl Scouts visited the Stirling Fire House to learn about what to do in the event of an emergency. 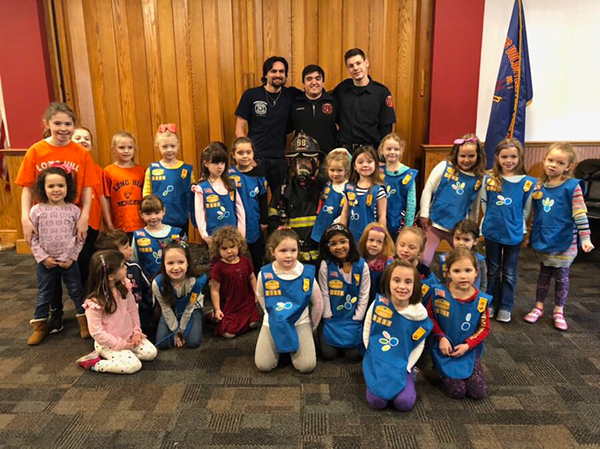 Kindergarteners from Long Hill Girl Scout Troops 7731 and 7732 recently spent a wonderful morning learning all about fire safety at the Stirling Fire House. Fireman Jeff Wanamaker did a great job explaining what families should do to prepare in case there is a fire, and what one should do if they find themselves in a situation where there is fire or smoke. The Girl Scout Daisies learned that if you are stuck in a place where there is smoke, you should throw a pillow, stuffed animal or anything else out the window so authorities know to look for you. Banging on the window also helps. “I walked away thinking about how important it is to have an escape plan and an external meeting place decided with your family in the event of a house fire. Everyone should know how to escape and where outside to meet should there be an emergency,” said Emily Nadeau, Troop Leader. The girls also got to see what a firefighter looks like with all their gear on and learned that even though their appearance in full gear may look scary, once you see it and know what to expect, it is not so scary after all. They ended their visit with a tour of the fire trucks, upon which they got to climb inside the cab and explore. Thank you to the Stirling Firehouse for this very fun and educational experience. (above) The Girl Scouts saw what a firefighter in full gear looks like.